With four of meeting weekly for the past year or so, we never have trouble with getting a crew together for a one day shoot. The issue is generally agreeing to and committing to a specific project, and the case was no different this time. Shortly after the theme announcement was made, we met to decide on what we'd do. After many ideas were suggested, we decided on a specific idea, and left Sanjay to write it. After a couple of weeks of Sanjay banging his head against the wall trying to write the original concept, he went with one of the other ideas we’d thrown around, which was "Delivery", an idea that might have fit in with the trailers seen in the Tarantino/Rodriguez Grindhouse movies. Sanjay wrote the trailer script in about 2 hours, rewrote it, then sent it back out to the group. The script for the original concept didn't get written. We met about a week before the shoot to discuss other ideas and finalize things, and only at that point changed focus from our previous idea to “Delivery”. We broke the script down, Sal to work on props, Sanjay to gather actors and Lee to create storyboards & shot lists. We decided to use Sal's place as the location. We also got commitments from two others to be part of the crew, so we ended up with 6 crew members total. On the night of the shoot it quickly became apparent that the actors would be the problem. Not having them, specifically. Lee wanted at least 10 for the party scene, but as we gathered, only 1 person was there specifically to act. Hardly the makings of a "raging party" the script called for! Sanjay and the Devindra made frantic calls to friends to see who could make it to act. They ended up getting two people and also adding Lee's girlfriend, we ended up with three actors, so the crew had to also act in the group scenes. Thank goodness for the shot list. And thank goodness for quick and dirty set ups. We ended up shooting around 22 set ups in a little under 5 hours. Almost all set ups were pretty much based on the storyboards. Looking at the final cut, almost everything included was on a storyboard! We did about 3 takes for every shot, just to make sure we had footage to work with. The most difficult shot to get was the one with our gaffer running in front of the car, he had to do the running bit about 6 or 7 times, he was getting pretty tired! The blood bit was done by placing our fake blood in a syringe and the director tapping the bottom of it in time with the slasher's hand. It turned out better than any of us anticipated. We shot using the Devindra’s trusty HD100 in 720p 24p (still a workhorse after three years). We did as many scenes hand held to save time. We shot on a Wednesday night, Sanjay did a rough cut on Friday in FCP 6 keeping the footage HDV. Then Saturday night Lee and Sanjay fine tuned the edit. While doing so, Lee and Sanjay agreed that what the piece needed was a voiceover, after originally intending to just place music over the piece. Fortunately Sanjay has the set up to do ADR work, so Lee wrote up the VO in about 15 minutes ("Guys, give me some pizza puns, quick!") and had Devindra record the voice over. Kai and Sanjay tweeked the VO a bit to make it more ominous (and cheesy). Kai composed the music that night. The film is uncorrected save for the shot of blood on the wall the in bathroom. We had a blast doing the whole thing, and save for a couple elements are pretty pleased with the final product. I don't know if the trailer makes you want to see the whole film, but hope you enjoy it anyways! and that is why you succeeded! Obviously that is what you were after and I really felt like I was watching a new slasher movie trailer. I also don't think I have seen one with a pizza delivery boy either? Maybe less red would help. 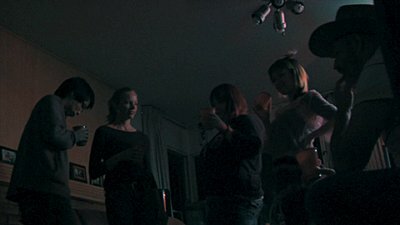 The shots were very dark and hard to make out exactly what was happening. Yes, "too red"... I will take the blame for that as it was my call, and I did want the party scene to be mostly red. I didn't know it would turn out THAT red. We should have had another white light to blend in with the red. And I also agree it was a little had to tell what was going on. Thank for watching & taking the time to comment! The Delivery boy slasher movie is a great idea. And I love how the title and voice over kept on popping up which made it really look like a classic old school slasher movie. Don’t know that I think the underneath shot of the doorbell works, either. No matter what I tell myself it still looks like he’s pressing down on a button--probably because it needed a door frame or something for perspective. That’s why the second time with the bathroom door it does work. Lighting on the gal hiding in the shower looked really good! I’d be interested in hearing what lights you used and how they were placed. If you say it was just available light then I'd like to know how that is set up, too! Following up on Lorinda's comments, I actually downloaded your entry and adjusted levels, brightness and contrast and color balance on some of the "offending clips", and I think it show there is promise in what you have shot already. I'm not sure if you don't have an editor that will give you these capabilities, but I think some passable images can come out of what you have. At the risk of being presumtious I have attached example frames below. Kai and Sanjay tweeked the VO a bit to make it more ominous (and cheesy). Didn't use all the pizza puns in the trailer, did we? That's okay by me, I love puns, so please salami to congratulate you on a job well done! Eh? You like how I did that? Come on, that was genius. Oh, shut up. I really don't have much to offer here, I'm sorry. 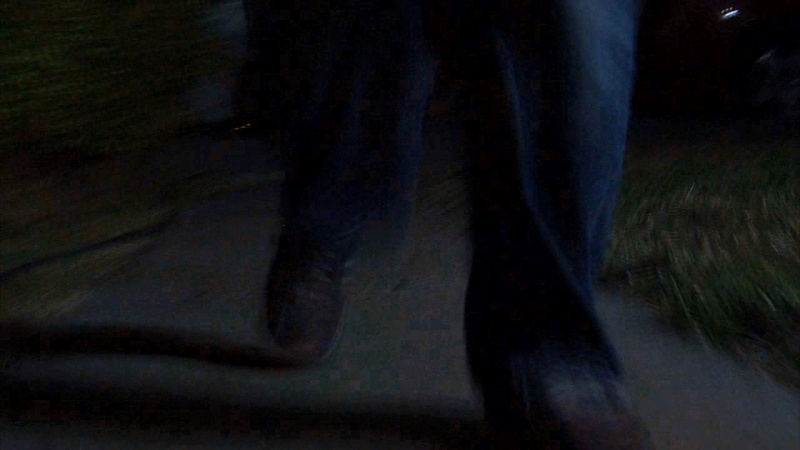 I think maybe shooting the killer ringing the doorbell from farther back would have been a better idea, show this hooded figure from behind as he reaches for the bell (for a moment I couldn't tell which way was up from that angle), but other than that I think you guys got exactly what you were going for. Some color correction to bring the blacks back down and tone down the red cast in the party shots would complete the package. That and maybe record a few extra, different versions of the girl's scream; it sounds like there was just the one, it's a tiny bit distracting. Crap, I was thinking of pepperoni. Do people put salami on pizza? Oh, whatever, I don't care, I'm leaving that pun up there. It's fantastic. Thanks Chris. We were on a pretty tight schedule so I had to choose between that and having enough time to upload. What did you use to correct the clips? I'm probably gonna do it in Color or directly in FCP. Jay, I just did it in Vegas, on a PC, using the standard level, contrast and brightness, and the color balance video effects filters. We actually didn't raise the brightness of the clips, We used the highest setting of "black stretch" on HD100 for the car scene then basically forgot to take it off. Earlier today I remembered that Lee said nothing was tweaked in post. Sorry for that mistake. About forgetting to change settings, that sounds just like something I would do. Lee, off and on today those pizza puns have been playing in my head and I laugh in spite of myself. :) Good job on that! Being new to fiction on films (my background is science documentaries), I had to look up the definition of a modern fiction trailer: 2 minutes 30 seconds max, 3 acts - #1 sets premise, #2 moves story forward dramatically, #3 wraps with dramatic scenes and music to recap and entice. Although on my screen the images were all very dark, I presume the original would have been more visible. Even so, this added some mystery to the show. Certainly the first two acts told the story of what was happening and built the drama. I think however the act #3 might have been better to stop when the little girl was discovered. As I understand the point of a trailer, it should not contain a "spoiler", something that gives away the ending. In this case I believe th last act gave the ending away. This was scary! Great blood spray and shower scene! The bathroom door thumping from the force of the killer is really scary. I love seeing horrifying things that are implied...so the killer is off camera but you know he is trying to break down the door. To me that is the scariest kind of shots. The VO was also really on point and the music brought me back to those old Halloween movies...(classics in my book!) I think it makes it even more scary that you are using kids as victims! The only thing that made me think- oh that's not scary- is when you get a quick glimpse of the killers face. If you kept him just as a hoody deliver man with no identity (maybe he's not even human???!! )- I think it would force the audience to use their imaginations- often way scarier than what one can put on screen. I think you could go two routes here. If you were to keep it super scary but still funny as a minor part, then I'd probably end it at "Delivery- serving death one slice at a time" (tho move the little girl in the closet shot farther up...very scary- how old is she????). To me that would have been really chilling. Or If you wanted to emphasize the humor of the piece, I'd keep all the puns at the end. It's really brilliant humor in my book- kinda "Family Guy" esque to keep on the same pizza joke for that long.